The rock art in the Kimberley sits in one of the world’s richest rock art regions and is a prominent cultural and social icon in Australia. Indigenous Australians are the Traditional Owners, makers and custodians of the rock art. The vast area and dynamic culture means there are many rock art traditions and they can have several names. We bring together knowledge from the two worlds – traditional (Aboriginal) and scientific (Western) to describe some rock art traditions of the northern Kimberley: either according to the most common rock art motifs of that period; by the names give to them historically; and their possible ages and meanings. In addition to rock paintings (‘pictographs’) and engravings (‘petroglyphs’), people made cupules, incisions, grooves, and complex stone arrangements. These rock markings occur in large numbers from the period Aboriginal people consider the beginning of time – tens of thousands of years ago up until recent times. Their meanings vary and may relate to: changes in ceremonial life and a possible increase in the number of ceremonies; landscapes modifying over time as sea levels and climate changes; and the marking of identity by people. Also called: Cupule, Pit & Groove Period. The art is dominated by large, sometimes life-size animals, fish, plants, and some human forms painted mostly in mulberry and red. Long flowing brushstrokes are used for motif outlines, solid infill to head, tail and limbs while body cavities have stippled irregular infill. Sometimes found beneath other paintings, suggesting an earlier age, perhaps from the Pleistocene (>10,000 years ago). This tradition may also include handprints/stencils and paint impressions of string and grass. Also called: Archaic Period, Irregular Infill Animal Period. Finely painted human figures are shown in elaborate dress with a rich range of artefacts including spears, boomerangs, dilly bags and ornaments. Colours vary from red to mulberry to almost black. Some animals depicted. 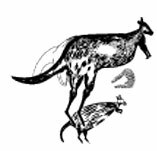 Initially known in the literature as ‘Bradshaws’ after the English pastoralist Joseph Bradshaw who travelled to the Kimberley in the 1890s and first recorded and sketched the paintings; the term was coined by rock art recorder Agnes Schulz in 1956. Now known as Gwion. Also called: Kujon, Kira Kiro, Diangargun, Bradshaws. Schematized, usually straight human forms; dominated by groups of people rather than deities, depicting headdresses, multi-barbed spears and spear throwers. They are finely painted in red and orange, with faded white and yellow paints, creating the illusion of unpainted or ‘missing’ parts. Painted over Gwions, they may be up to 9,000 years old and possibly reflect a social response to rising sea levels and changes in territory. Also called: Missing/Straight Part, Clothes Peg Figures. A rock art expression often involving broad brush strokes and superimposed over the earlier art styles. Striking hand motifs can have intricate geometric designs. This tradition is enormously varied with bichrome and polychrome depictions of objects, humans, animals, plants, lines, finger dots and non-figurative motifs. This diversity may show the marking of clan estates during the Holocene (last 10,000 years). Also called: Clawed Hand, Compartment Infill Period. Aboriginal people in northern and central Kimberley continue to identify with Wanjina, a continuous tradition dating to the last 4000 years. As figurations of supernatural power, images of Wanjina are characterised by halo-like headdresses and mouthless faces with large round eyes, set either side of an ovate nose. These ‘Creator Beings’ and the ‘Wunggurr Creator Snake’ are painted in many forms and can be repainted to ensure annual renewal of the seasonal cycle and the associated periods of natural fertility. The actual Wanjina is believed to either reside in the rock where it is painted or to have left its body there. Also called: Regular Infill Period, Polychrome Art Period.